I came across a copy of The Little Deaf Child: A Book for Parents, a short book published in 1928 reassuring parents of deaf children that with proper training and education, there was hope for their children. The book was written by John Dutton Wright (1866-1952), the founder and director of the Wright Oral School in New York City, which was established in 1902. The school was originally the Wright-Humason School, founded in 1892 jointly by Wright and Thomas A. Humason on 42 West 77th Street, New York City. The school had a limited enrollment of 25-30 pupils; Helen Keller was one of the pupils, trained to read with her fingers and improve her speech. The Little Deaf Child offers guidelines to parents in terms of training and education of young deaf children, for “[v]ery much can be done along these lines at home while the child is yet too young for school and this is where I hope this little volume may be of some service to the perplexed mother, wholly inexperienced in the situation which confronts her” (17). Wright divides the training of the young deaf child in to three periods: (1) For the first two years of life; (2) for the third and fourth years of life; (3) for the fifth year of life. By the time the child reaches age six, it is best to enter the child into one of the special schools for the deaf, or, if preferred, for the parent to employ a specially trained and experienced teacher in the home. Wright advises parents to begin immediately by evaluating the child’s residual training to begin auricular training. Then, the child is taught to assess his or her other senses, and then, when the child proves to have retained some hearing sufficient to be employed, lip-reading training should begin. Gestures should be minimized and the parent should avoid “spoiling” the child. During the second period, the parent should asses the child’s sight, continue sense training by cultivating the child’s muscular sense, sense of sight, and touch; games of imitation (e.g. piling up blocks), could aid in this training process. Further hearing tests and lip-reading training should continue—moreover, the parent should concentrate on teaching the child to “listen to sounds for the purpose of getting ideas and not merely for the purpose of perceiving sound.” By the third period, the child should learn to read and speak through a variety of exercise that Wright provides in the book. The book additionally provides a list of special schools for deaf children, with an overview of the common methods used in these schools. Although most schools used a form of the “Combined Method” (speech + speech-reading + auricular training), there were some schools that focused strictly on the “Manual Method” (sign-language), the “Oral Method” (speech + speech-reading + writing), or, as with the Wright Oral School, the “Auricular Method” (speech + hearing + writing), which made use of the hearing of semi-deaf pupils with or without the use of acoustic aids. The auicular method, it should be noted, was largely directed to educating pupils as hard-of-hearing speaking persons, rather than members of the Deaf community. I believe that an adequate examination of all the pupils in our special schools for the deaf would show that fully one-third of them—that is, more than three thousand—are suitable subjects for such training of the brain through the normal channel of approach…It has been my experience that while artificial aids to hearing may sometimes be useful in the earliest stage of awakening attention to sounds, and in the later stage in extending the range of which the hearing can be made of service, throughout the real education process of teaching the brain to associate meaning with sounds and to remember those associations, the use of the unaided voice, applied directly to the ear, produces the best and most rapid results. Wright’s work at the school secured his reputation as a pioneer in education of the deaf with the use of acoustic aids and auricular training. He was also one of the first directors to include sound amplifiers in schools. He published several journal articles, especially in the Volta Review, the publication of the Volta Bureau (est. 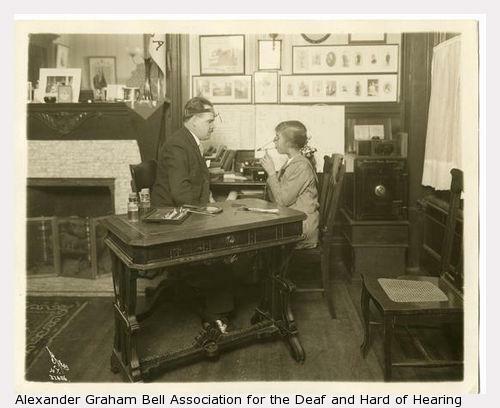 1887, now the Alexander Graham Bell Association for the Deaf and Hard of Hearing). The Volta Bureau advised all mothers of deaf children to read The Little Deaf Child. 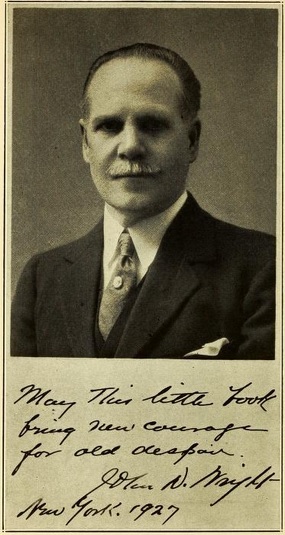 Active in civic affairs throughout his life, in 1920 Wright traveled the world with his wife and two children, occasionally visiting schools for the deaf. He was particularly influential in the creation of Japan’s first oral school for the deaf. 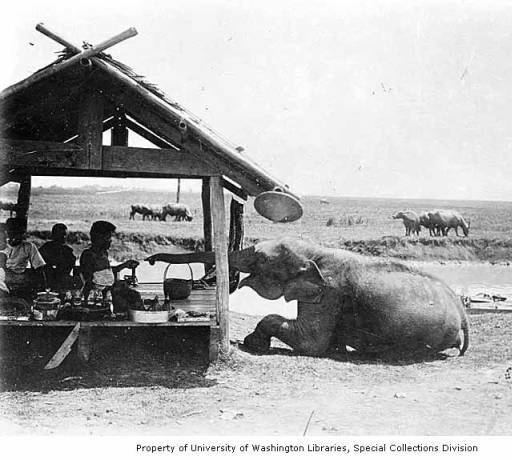 A collection of Wright’s travel photographs can be viewed at the Dutton Wright Photographic Collection at the University of Washington, some of which I’ve included below. 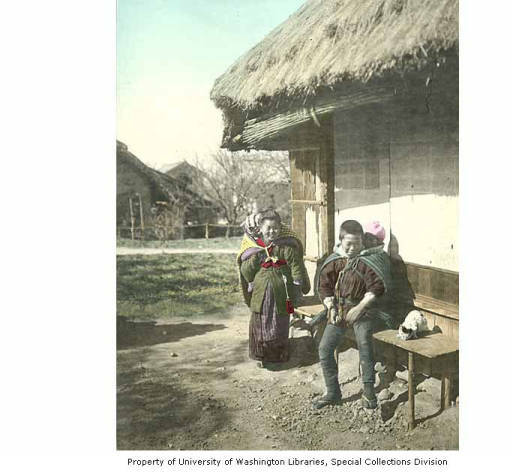 Wright’s photograph: Boy and woman with babies on their backs, Japan, ca. 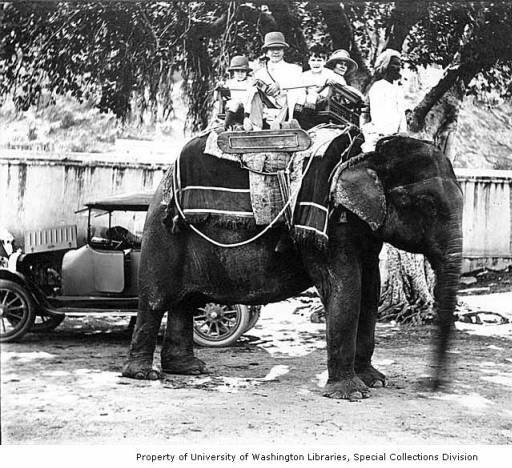 1921 (University of Washington Libraries). 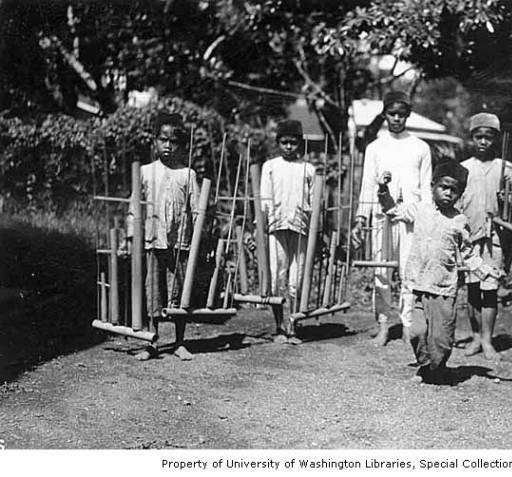 Wright’s Photo: Group of boys with bamboo instruments called angklung, Java, ca. 1921 (University of Washington Libraries). Fascinating reading and reinforced my admiration for my mother. We had a roller coaster relationship throughout our lives together. Mum always felt she didn’t do enough with my pre school years once my severe deafness was finally confirmed by medical assessment at age of two. Having recognized I was unable hear at age eight month old she took up the challenges without delay and I continue to thank her daily since her passing 1995.